Recently I discovered making mini wonton bowls via Recipe Tin Eats. I am just in love with this idea. 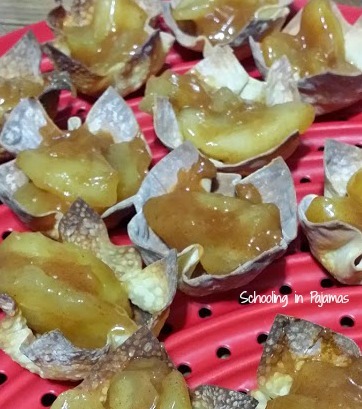 While surfing through her blog, I discovered her Mini Apple Pie Wonton Cups. I just knew this would be my next baking project. Holy Moly were they good. Preheat oven to 350 degrees. Spray your muffin pan (regular size) and place one wrapper per cup. *I put cupcake wrappers, then lightly sprayed before placing the wrappers in. Lightly spray the wonton wrappers before placing in the oven. Bake 8-10 minutes or until golden brown. Keep an eye on them as they are easy to burn. Place butter, water, apple pie filling, cinnamon, and brown sugar into a pot. Heat on medium and cook for about 5 minutes util heated through and everything is combined. Take off stove. Once wonton bowls are out of oven, let cool for about 5 minutes. Then spoon in apple pie filling and top with cold vanilla bean ice cream. Enjoy! Check out Recipe Tin Eats for the original recipe. The next time I fix these, I’ll probably use pastry dough as well as larger muffin tins. They were yummy and gooey and scrumptious. These look incredible! 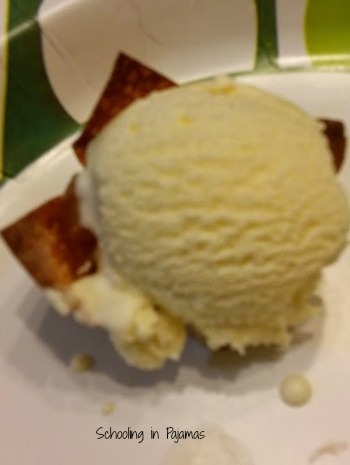 I LOVE that you added ice cream on top. I’m going to do that next time! !